Technique: Wide field intensified camera with all-sky lens. Instrument: Part of INT system. This camera consists of a 15 mm f2.8 Canon lens, an XX1332 image intensifier with large 48-mm photocathode, and a Sony handycam camcorder (recording of video output on Hi-8 tape in NTSC format - 640 x 480 pixels). The field of view is about 160� when mounted so that the dome does not obstruct. Moonlight is blocked by covering the zenith part of the dome. Heritage: This camera was flown before to record meteors. Same setup. 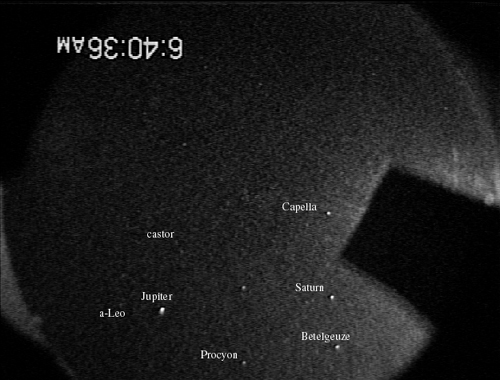 Instrument validation tests: This cameras was flown before for near-real time flux measurements of meteor storms during the 2002 Leonid MAC mission when a bright Moon was at about 38 degree elevation (see picture above). Sensitivity: With a 160 degree field of view in long axis of camera (left-right on aircraft) and 124 degree in short axis (front-aft), the star limiting magnitude is about +3.0 magnitude, somewhat less with Moonlight. 2002 Leonid MAC mission record has lmiting magnitude about +2.0. 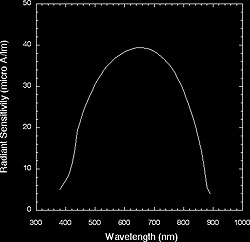 Here, we will choose 160� fov in short axis (front-aft), further lowering the limiting magnitude to about +1.